A selection of rare photos of Jagdgruppe 300 and/or JG 300 wrecks most probably photographed at Salzburg Ainring during April/May 1945 following the capture of the airfield by US forces recently sold on Ebay. Note that the (probably) Erla-built G-10 (see photo above) features blue/white/blue fuselage bands and a short Gruppe bar. Jagdgruppe 300 was 'officially' established through the amalgamation of II. and III./JG 300 in April 1945 and is mentioned in a Luftflottenkommando 6 ORB dated 03 May 1945 (!) but as the following account indicates probably only 'existed' on paper. It is hard to believe that anybody was still applying Gruppe Balken in April 1945 - especially since III./JG300 & IV./JG300 never utilised Gruppe markings, while I./JG300 had already been disbanded - but had Bf109G-10s in the WNr. 491000 series. "....Towards the end of the morning, in something of a daze, we took off from “Wiese Kreuzstraße” . This was my first and last sortie at the controls of a 109 K-4. Passing over the front lines, my ship was seriously damaged by anti-aircraft fire, my engine quickly losing a lot of revs. I had to turn back. I indicated to Klaus Lambio that I had to turn for home and that he was henceforth in command for the rest of the sortie. He acknowledged my message with his usual calm, asking me if I was wounded. I replied in the negative. He wished me good luck and that was the last I heard of him for many long, too long, years...."
"...In front of my 109 I saw a mechanic throw himself face down in the grass… It was at that moment that I realized that the roaring engine noise I could hear was not familiar. Streaking past to my left barely twenty metres off the ground, two Thunderbolts roared low overhead, strafing aircraft and installations and setting off a widespread stampede for cover. Then two or three other Americans released napalm bombs. I saw two P‑47s disappear off to the south trailing smoke. In the mid-distance a parachute swung for a few seconds above the trees of a small wood. None of this was really important any more as Salzburg-Ainring was going to be our last airfield and would soon come under threat from the enemy advance. Hauptmann Fritz Lonzius put in a quick appearance a few moments later and brought us together in front of an ad hoc command post. It was then that I realized that a few III./JG 300 pilots had managed to land on this field. More arrived towards the end of the afternoon, landing at the controls of two Messerschmitt Bf 109s and a Bf 108. There was no more than a handful of us men left now. For the first time, “Timm” Meyer and Werner Maybohm were absent from this roll call. About twenty pilots and around one hundred male and female mechanics, had preferred to surrender to the Americans rather than undertake the dangerous road journey to Salzburg. We were told that henceforth our new designation would be “Jagdgruppe” 300 and not Jagdgeschwader 300. For my part, I flew no further combat sorties prior to the capitulation, apart from one short airfield protection flight on 2 May 1945 in the 109 marked with the double chevron of Hauptmann Lonzius. As I recall Lonzius had fled to Linz in a Bü 181 that same day. Our Gruppenadjutant Willi Miholek even claimed that he had put on the overalls of a Gefreiter mechanic in order to avoid interrogation and get home more easily. At Salzburg-Ainring, our principal concerns were food and shelter. 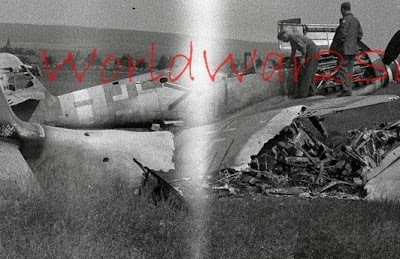 The last drops of fuel were siphoned off from the tanks of the numerous abandoned aircraft.."